Edit: Current requirements: 1A will be alright, 2A I'll be happy with and anywhere close to the full 3A on offer from from the laptop power brick I'm using (see below) will be great. I will use a 240V AC to 24V DC laptop power brick capable of outputting 3A. The PWM circuit I'll be using will be powered from the 12V rail. The USB ports will come off the 5V rail. The power on indicator LED (not shown) will most likely come off the 3.3V rail. I'm assuming the voltage regulators should be in parallel, each taking the full 24V input, even though there will be a large difference between input and output for a few of them (eg 24V to 3.3V). I thought about putting them in series so that the 12V output of the first regulator would feed the 9V regulator which would feed the 5V regulator and so on, but the circuitry of each regulator block in my diagram above would divide away some current, leaving me with very little of the 3A max input for the lower voltage rails. Is this correct? I'm also assuming that the larger reductions in voltage necessary for the parallel arrangement as shown will produce more heat than in series, but each regulator will have a nice fat heatsink and the whole thing will be enclosed in something with at least a fan or two and plenty of holes for ventilation. 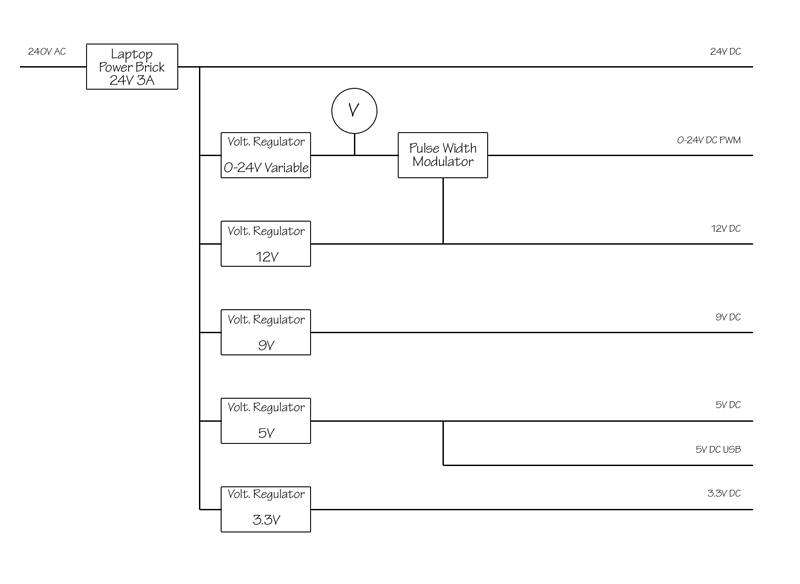 The variable voltage rail will be controlled with a potentiometer into a variable voltage regulator (LM350). Should I use different fixed voltage regulators for my fixed voltage rails, or use an LM350 for each, and set their outputs with either fixed resistors or trim pots? As the laptop power brick I'm using outputs 24v already, shall I wire that directly to an output terminal for my 24V rail, or should I also put a voltage regulator in there? Ideally, there'd be no point regulating 24v to 24v, but I'm not sure how reliable the voltage is from a laptop power brick. I'm not even sure you can get out of a regulator exactly what you put in - there must be some voltage dropped along the way. If necessary, is there another way I could ensure a constant 24v output? I saw a tutorial somewhere a while ago where someone hooked up a voltmeter to a psu, but the instructions mentioned using a 9v battery and a relay to power the voltmeter rather than drawing power directly from the internals of the PSU. Should I do this? There was no reason given in the tutorial I read. As mentioned above, I was going to draw power from the 12V rail.